I've shared before the fact that barbecue is one of the types of foods that makes my mouth water, and my love of Tex-Mex/Mexican is legendary. That's what made our recent weekend trip to Austin, Texas pretty special: the city does both of these really well (it also does cocktails well, which I wrote about last week). 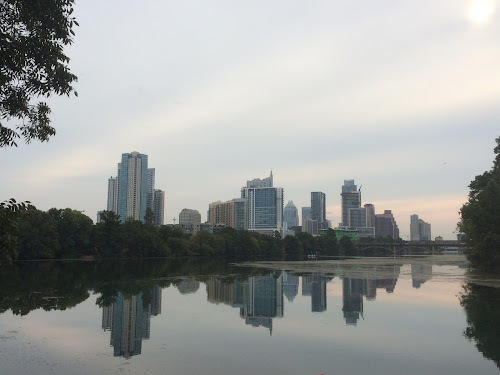 Over the course of a few days, we samples some pretty amazing barbecue and Mexican restaurants and also discovered a wonderful morning food Austin is known for: the breakfast taco. Austin is the capital of Texas, but it is also the capital of Texas-style barbecue. After all, it's home the country's most famous barbecue restaurant, Franklin. As much as I'd have loved to try Franklin, I wasn't willing to give up half a day of a short vacation to stand in line or it. Nonetheless, we still found excellent barbecue in the city. Hungry after the long flight on our first night, we set out for Stubb's, the casual barbecue joint and music venue that was a short walk from our hotel. You might recognize the name for their national brand of barbecue sauces and rubs. 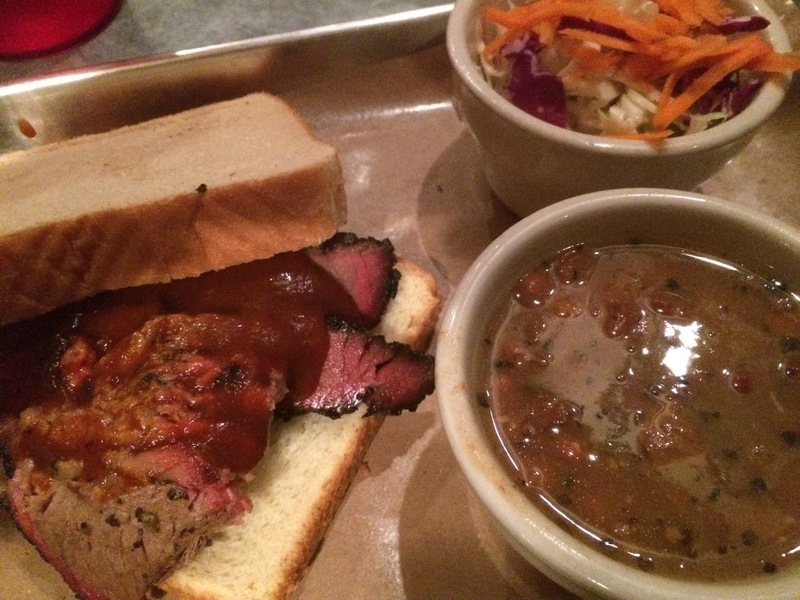 We settled down for a delicious plate of sliced brisket served on Texas sliced bread. This brisket was a real winner--tender, moist and meaty. It was smoky, but not overly so. We also enjoy the coleslaw, which showed admirable restraint with its creamy dressing, as well as the creamy potato salad. The beans you get with Texas-style barbecue may be unfamiliar to those expecting the sweet Southern-style baked beans. Although I've seen recipes for Texas-style beans with honey, brown sugar or molasses, when I've ordered them in restaurants they are not typically sweet, at least not as sweet as the Southern-style baked beans. That said, they are really good and nicely complement a helping of smoky meat. Stubb's was hosting a band the night we went in, but thankfully we were able to get a table quickly and had prompt, friendly service (I appreciated that Stubb's has actual table service). Basically, within an hour of landing in Austin we had barbecue, live music and even saw a fight (of sorts, as a group of guys sitting near us got a little rowdy). How perfect is that? On another night, we headed to a different kind of barbecue restaurant, Lamberts. This is a little more upscale than your typical barbecue restaurant, and their menu features grilled items in addition to its oak-smoked barbecue dishes. The restaurant is located in the historic Schneider Brothers building in the Second Street shopping district. While the grilled dishes were tempting, we stuck with barbecue, enjoying the black angus brisket with brown sugar, coffee rub and pickled escabeche (jalapeño). Although I'd say we preferred the Stubb's brisket, the black angus short rib was out-of-sight good. 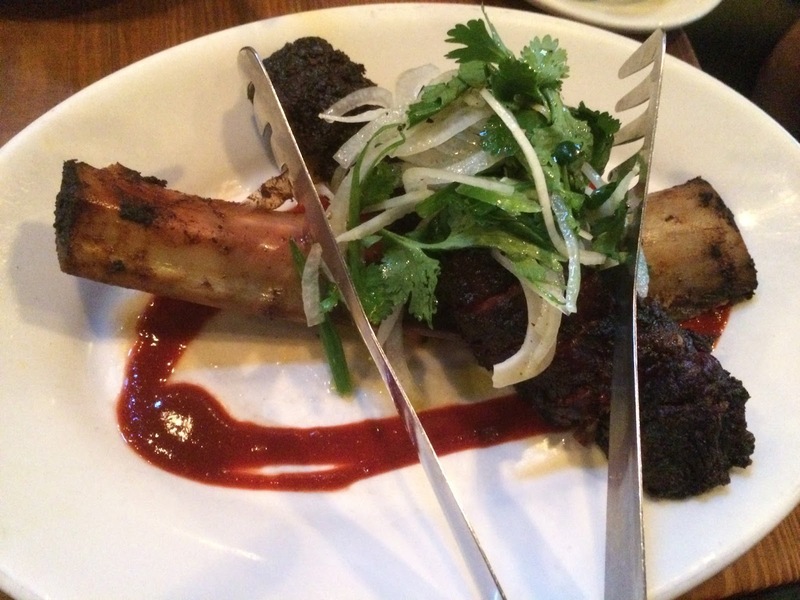 The tender, flavorful rib was garnished with a spicy cilantro and scallion slaw plus a fennel and caper relish. Our other sides were also good, particularly the Brussels sprouts with bacon and brown butter. The service at Lamberts could use a little attention. They were very efficient, perhaps too much so, and not as friendly as the servers we encountered elsewhere. I was also disappointed with how our food was served, which made it difficult to share. When ordering, I asked the server if it made sense for us to choose a couple of barbecue entrees and sides to share, which she said was a good plan. Yet, our food arrived as individually plated entrees rather than family style, which made dividing the plates to share a bit of a hassle. Sharing is such a trend in restaurant-eating now, that it is surprising to find a restaurant that doesn't make it easy. That said, the food at Lamberts was quite good, and it's one of the few options for barbecue where you can get a reservation. They also made a quite decent Old Fashioned with demerara sugar, bitters and a thankfully simple garnish of orange peel. Before I move on from barbecue, I want to give a shout-out to Iron Works BBQ. Chris and I did not go here, but I visited it a couple years ago during a business trip to Austin, and it was fantastic. It doesn't look like much: the interior is a bit ramshackle, with tables covered in those cheap red-and-white plaid vinyl tablecloths. But that's part of the charm, accentuating the down-home vibe of the really excellent barbecue. I sat on the back porch overlooking Waller Creek and enjoyed an amazing sampler of sliced brisket, beef ribs and sausage. You know how some restaurants will warn you a dish is spicy, but when you eat it, it's really not that spicy at all? At La Condesa, they aren't kidding around with the chiles. Their cochinita pibil tacos, made with achiote-braised pork shoulder and pickled habanero, set my mouth on fire. But man, were those tacos good. 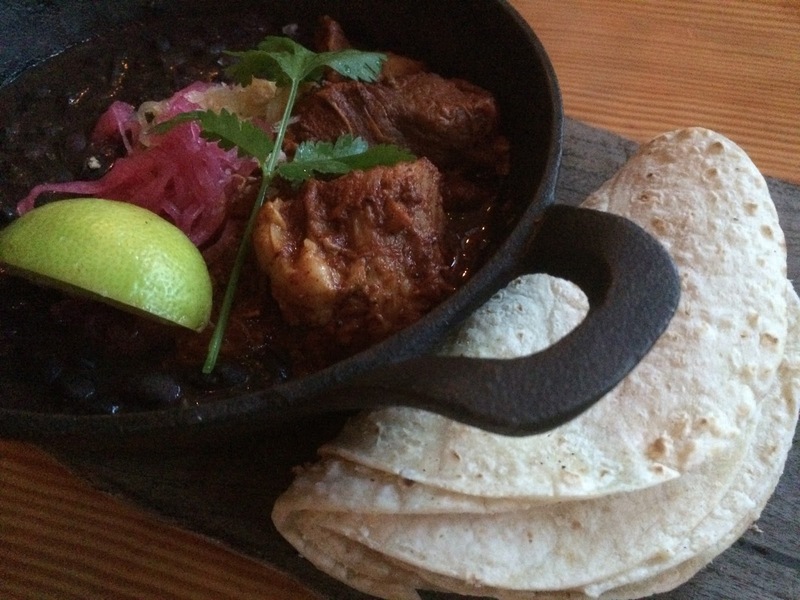 The heat was moderated with black beans, pickled red onion and cabbage. It was one of several delicious things we tried at this downtown Austin modern Mexican restaurant. We also enjoyed the mole dominguero, a tender seared chicken breast served with a delicious mole sauce and grilled green beans. Guacamole is, of course, a great way to start the meal. We customized ours with roasted pumpkin seeds and queso fresco. It didn't hurt that they served the avocado dip with very good corn chips--always a plus. Dessert was also quite good. We ordered the dulce de leche, a pudding cake with saffron and cream cheese ice cream the menu said included "sweet corn." Since fresh sweet corn was just ending its season, I was expecting fresh corn to appear in the dessert, but it turned out that sweet corn was caramel popcorn. I'm seeing popcorn more and more in desserts and I'm loving it. Such a simple way to add another interesting dimension to a dish. Another thing La Condesa is serious about are their margaritas. La Clásica is a wonderful choice, made with El Jimador silver, Patrón Citrónge, lime and agave kicked up with a cactus and lemongrass-infused salt rim. The smoky and tart Día de Los Muertos, made with mezcal, Cointreau, Lillet Blanc and lemon was another winner. We ate a lot of good meals in Austin, but our dinner at La Condesa was possibly my favorite of the trip. The other really good Mexican meal we had in Austin was at Guero's Taco Bar. We were wandering in and out of the shops on South Congress Street on a very hot day (it was in the mid-to-high 90s each day), and I was really ready for a good lunch by the time we hit midday. Chris sprang from the brisket tacos with braised meat that so tender and glazed with a spicy-sweet sauce. They were quite possibly the best tacos of the trip. 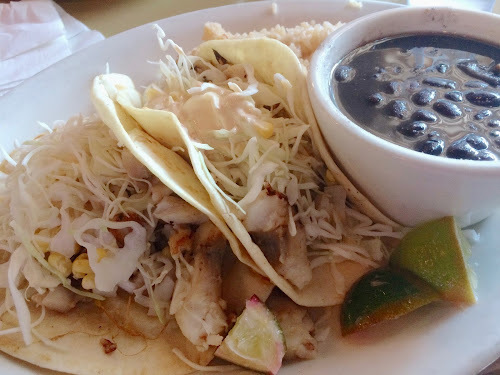 I had the fish tacos with marinated and grilled white fish, shredded cabbage, corn and chipotle-tequila mayonnaise, which were also very good. Also of note at Guero's were the rice and beans. A lot of Mexican restaurants serve them as sides but don't put much thought into them. At Guero's, both were very good. Although the margaritas were just average, the tacos here were outstanding and the service, despite how busy the place was, was friendly and attentive too. Starting the day off with a good breakfast is critical while on vacation. 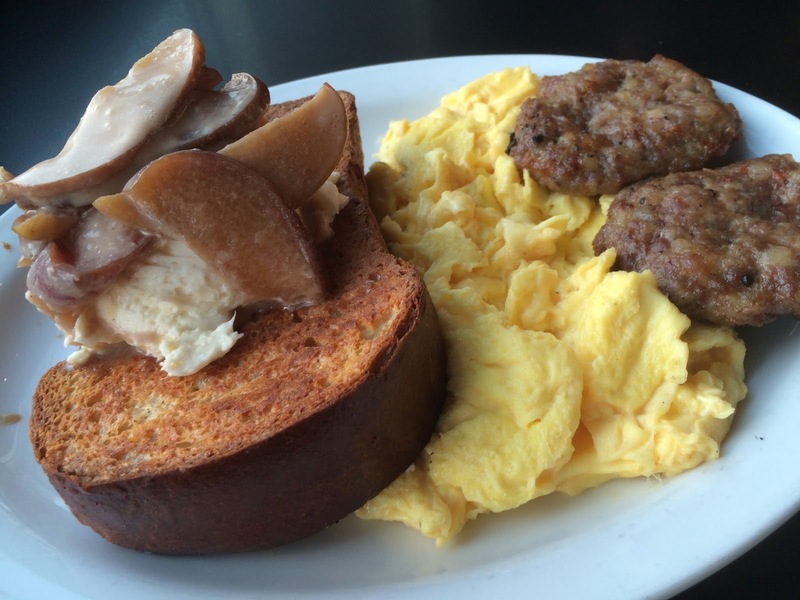 We loved the food at 24 Diner so much, we went there twice. This 24-hour diner, location in the North Lamar shopping district near the flagship Whole Foods market, has a casual cool interior that's both retro and modern. It also boasts a menu as inviting as its decor. During our first trip, we both had hash plates, hot dishes with potatoes, onions, cheese and meet. The 24 hash is a classic rendition with bacon and sausage and a bit of heat from jalapeños. The sweet potato hash was also quite good, served with roasted poblano peppers, sausage and jack cheese. On day two, we sprang for sweeter breakfast treats. The Belgian waffle was very good and came topped with a heaping mound of brown sugar butter (along with maple syrup on the side). 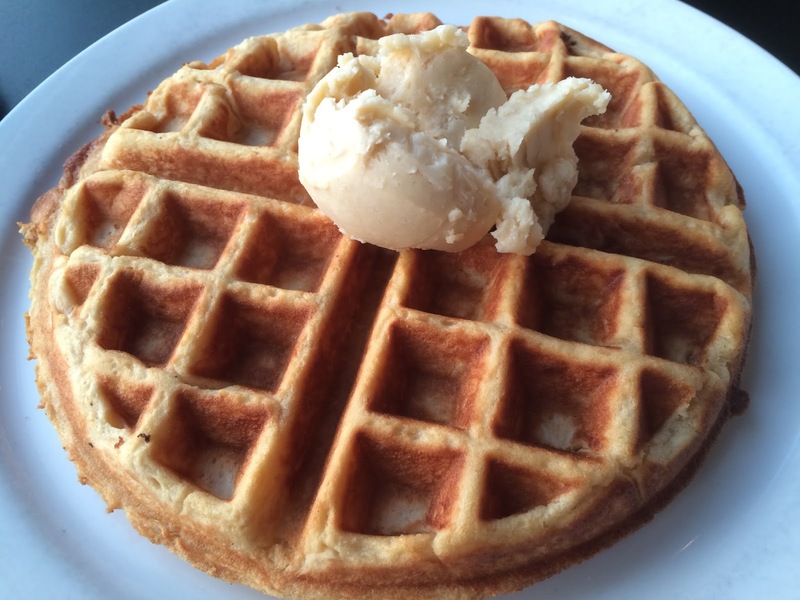 The waffle itself was made from yeast-risen dough and vanilla, giving it a taste almost like French toast. Speaking of which, they do that well there too. The French toast platter came with giant-sized pieces of toast and an apple compote topping plus lots of butter. The friendly staff at 24 Diner always kept our coffee cups coming. Were we Austin natives, this would be the kind of place I imagine we'd frequent often. The other great breakfast find in Austin was breakfast tacos. Breakfast burritos are everywhere, but tacos? That's an Austin specialty, and it's a wonderful idea. Our favorite breakfast tacos were from Taco Joint, a no-frills kind of place just north of the University of Texas campus. The menu offers a few suggestions for tacos but allows for plenty of customization too. They also provide a nice bar of additional sauces and garnishes. The steak and egg with smokey gouda cheese really hit the spot, especially with a little chipotle cream salsa on top. I also loved the sausage and egg with tomatillo salsa and the potato, onion and cheese taco. We ordered all of these with corn tortillas, which they smartly double for better taco integrity. All of them were delicious--hot and flavorful. Keep your eyes out for a recipe later this week inspired by our breakfast at Taco Joint. 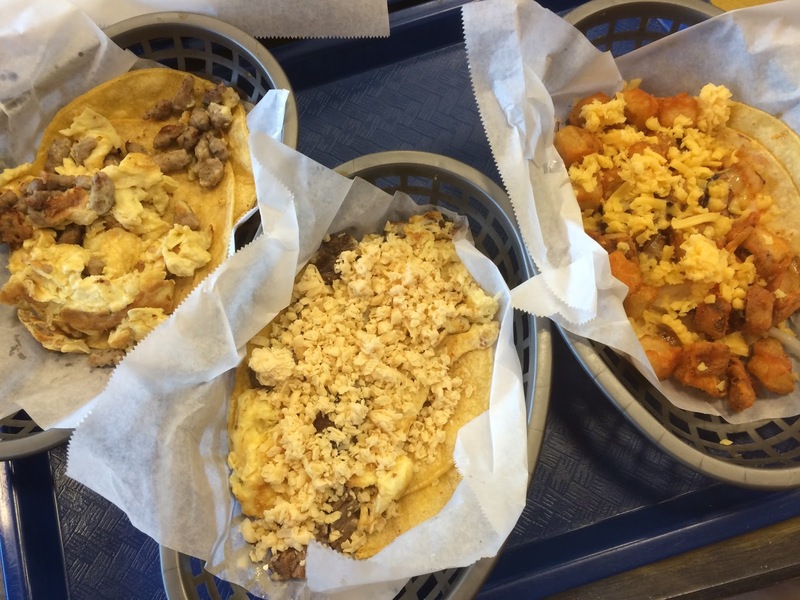 Our other foray into breakfast tacos was at Taco Shack, a small local chain with a similar offering. 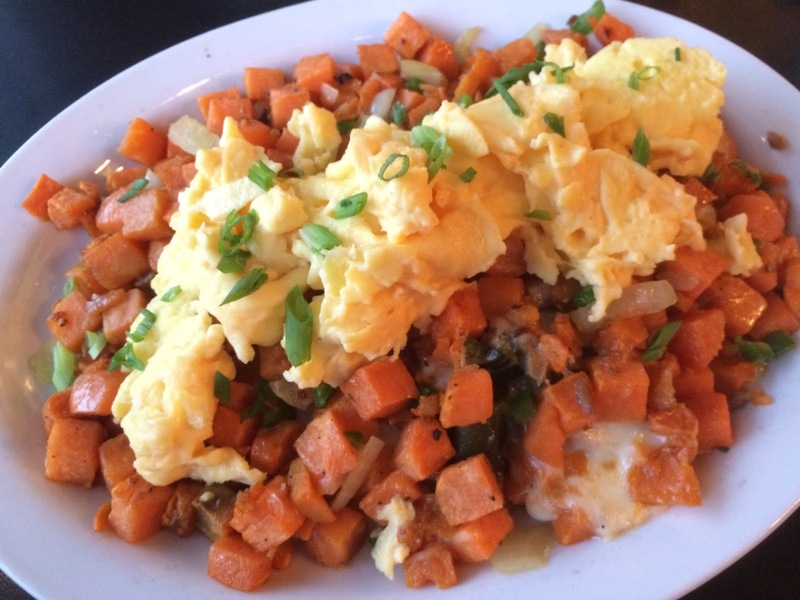 The Texan was a delicious blend of scrambled eggs piled with slices of beef fajitas. The El Niño was a spicier offering of beans, chorizo, cheese and jalapeño. We had these tacos with flour tortillas and a little green salsa and both were delicious. I think it's safe to say we had our fill of a lot of favorite foods in Austin. I know the city is known for a lot of creative cooking in other genres too, such as Qui, the restaurant from Top Chef winner Paul Qui. I suppose we'll just have to go back. Starting with more of those breakfast tacos. 24 Diner, 600 North Lamar Boulevard, Austin, Texas. (512) 472-5400. Guero's Taco Bar, 1412 South Congress Avenue, Austin, Texas. (512) 447-7688. Iron Works BBQ, 100 Red River Street (at Water Avenue/East First Street), Austin, Texas, (512) 478-4855. La Condesa, 400A West 2nd Street (on the corner of Guadalupe Street), Austin, Texas, (512) 499-0300. Reservations: Open Table. Lamberts, 401 West Second Street (on the corner of Guadalupe Street, opposite of La Condesa), Austin, Texas, (512) 494-1500. Reservations: Open Table. Stubb's, 801 Red River Street (on the corner of 8th Street), Austin, Texas. (512) 480-8341. Taco Joint, 2807 San Jacinto Boulevard (two blocks north of Dean Keeton Street), Austin, Texas. (512) 473 8223.